You probably do not think much about the roof of your house unless it has a problem. It is easy not to notice the everyday wear and tear on your roof until it becomes a big and expensive problem. Your roof is actually getting older and being exposed to the elements even right now as you read this website. Roofs are made of durable material, but the extremes of climate in Ohio can still take their toll, and regular roof maintenance can make your roof last twice as long, which will save you money in the long term. Roof maintenance is also important because many warranties on roofing materials become invalid if you do not regularly perform maintenance on your roof. That means that roof maintenance can make repairs cost less when you do need them. If you have ever sat on someone’s roof and watched the world go by on a hot Ohio summer afternoon, you have experienced how the roof is always being hit by direct sunlight. You were probably ready to go back inside after less than an hour, but your roof has to endure the blazing heat of summer day after day and year after year. That is only the sunny days. The Midwest is also famous for its summer thunderstorms which, with their high winds, can send debris crashing into your roof and knocking shingles loose. That doesn’t even take into account the damage than can happen if there is a nearby lightning strike. In the winter, your roof has to endure the cold temperature and the weight of the snow and ice. Our blizzards can also leave your roof at risk of getting hit by debris. You can always count on Hamilton Roof Pros to inspect your roof and perform routine roof maintenance. You should have your roof inspected once per year to see if it requires any maintenance. The best time to have your roof inspected is in the fall. 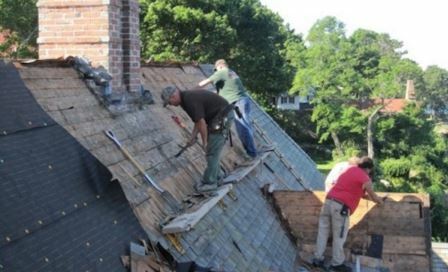 This is because the winter is the season when roof damage is most likely to occur. If you have your roof inspected in the fall, then if it gets damaged in a winter storm, you will know exactly which damage was caused by the storm, because the damage was not there before it. We will perform a visual inspection of your roof and also a moisture survey. Water seeping into your roof is a major cause of damage, and the moisture survey can detect it before the damage becomes noticeable. Moisture in your roof can be measured by infrared scan, nuclear isotopic meters, and electrical capacitance and resistance meters. If your roof has more moisture than normal, it is a good idea to get the damage repaired before it gets worse. It will cost a lot less to get it fixed than it will to let it go until it gets bad and then pay to replace the whole roof. Hamilton Roof Pros will never try to talk you into repairs that you do not really need, and we offer our services at affordable prices.